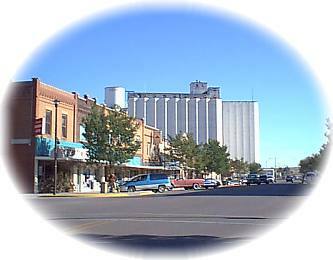 Our Town...GORDON is just 15 miles from South Dakota and 120 miles from Wyoming. This is the home of Mari Sandoz. All of her books are available at the drugstore and at the Ad Pad- Tourism Information Center where a small museum of Sandoz Country history can be visited daily. Not many settlers were in the area before 1884. Judge Tucker, U.S. Commissioner at Valentine, convinced the Rev. John Scamahorn of Sullivan, Indiana, that northwest Nebraska was "a paradise for agriculture development" while in attendance at the Louisville Exposition in 1882. The next year, Scamahorn and a few friends came out to look it over. He returned home and organized a colony. In the winter of 1884, he and 104 sturdy folks journeyed to rail's end at Valentine, then on west by means of ox drawn wagons. They set up their tents beside the "Lone Willow", the only tree of any size in the area, near the present site of Gordon. A nine-trunked old willow tree still stands as a landmark to their campsite. The good reverend conducted church services and using a shoe box for stamps, set up the "postal service". Scamahorn discouraged the use of his name for the town, suggesting instead it be named for John Gordon, whose ill-fated pilgrimage into that area in 1875 had resulted in the loss of his wagon train and possessions. The name was accepted. Many Renaissance people were Gordon's early settlers, but they were only the first of the industrious, creative, spirited citizens who typify the Gordon community. Some have made contributions to society far beyond local boundaries, like Dwight Griswold, Governor of Nebraska, Ambassador to Greece and United States Senator during the 1940s and early 1950s and Val Fitch, a 1940 Gordon High School graduate who received the Noble Prize for Physics in 1980. Perhaps the foremost person associated with this area is Jules Sandoz, immortalized by his eldest daughter, Mari Sandoz, in the biography, Old Jules. Mari Sandoz (1896 - 1966) is increasingly recognized as one of the most gifted writers in American literature. James M. Riley --" Doc Middleton " -- was Gordon's most notorious resident. "Doc" was born in 1852 and came to Nebraska after beginning a career as a horsethief and murderer at the age of 14. In 1879, Doc married and made intentions to reform, but his gang and way of life were too tempting. In two years over 2,000 horses were stolen from ranchers as well as the Sioux Indians. Three children were born to Doc and his third wife, Rene. When his first born, LuLu, died, she was buried in the Gordon Cemetery. The marker is still there. Most of the murders Doc committed were a result of revenge taken on one who committed a crime against anyone he felt attached to. The old timers say that when a poor family in Gordon had a little girl that got sick, Doc paid for a doctor's care. When the child died, Doc had the casket made out of the bar in his saloon. Today, US Highway 20 and Nebraska 27 intersect in Gordon, reinforcing its natural location as an agricultural and commercial center and also its development as a medical and cultural center. Nebraska Highway 27 coincides with Gordon's original Main Street, a thoroughfare that has pulsed with the life of the town from its earliest days. Here, and throughout the extended, far-flung community, resources merge to create continuity and progress. The town has a nine-hole golf course, new ball field, bowling alley, municipal swimming pool, nice theatre, three smaller picnic parks with playground equipment, and three museums. The Regional Arts Alliance brings professional entertainment, music, theatre, and ballet to the community. Annual special events include: the Sheridan County Fair and Rodeo, the Willow Tree Festival, Town and Country Days and Spirit of Christmas. The greatest resource of all, now as in the past, is the people who call Gordon home. You will be challenged by a tough nine-hole grass greens course, "the best in the west," located on the west edge of town. Several tournaments are sponsored during the season. Youth activities are important at the club and visitors are always welcome.